I received the suits today. They are extremely beautiful. Thank you to you and your company for your service. 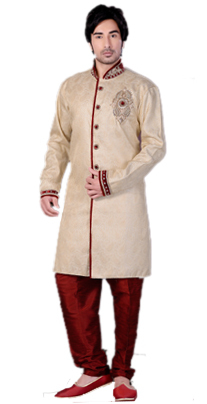 Shopping online through Indianattire.in was a very pleasant experience. I look forward to doing business again. Thank you so much. Thanks so much for the dress , i really love it and it makes me look georgeous and Elegant. Will send u copies of the pic taken with the dress. Take care and say a very big thank you to the other crew. Thank you for your considerate service. The dress arrived yesterday. Looks great. Yes, I did indeed receive my outfit yesterday and it is nice! Thank you so much! www.Indianattire.in is an initiative of Fashion Warehouse, an online store offering Indian clothing and accessories for Women, Men and Kids. Our huge Indian clothes collection consists of sarees, salwar kameez, ghagra choli, Indo-western outfits, lehenga choli, Indian party wear, men's kurta and children's clothing. All suits requiring stitching are custom stitched at no extra cost. You can use our user-friendly measurement form to submit measurements. You may also order Plus size Indian clothing. You can have your saree made into a pre-stitched saree that can be worn as a skirt. We also stitch customized blouses and petticoats for sarees. All the garments are made in our own facility making it possible for us to offer you good products at the cheapest price. We use one of the best and most secured payment gateway. All your data is protected and we assure you complete privacy. We use the best courier companies to deliver our products to your doorsteps, in any part India. For deliveries outside Indian please visit www.indianattire.com. You can have your items gift wrapped if they are to be delivered as a gift. care@indianattire.com All contents © 2004 Indianattire.com. All Rights Reserved.